Center for Global Health, Oregon State University, Corvallis, Oregon, USA. Action Against Hunger, London, UK. Center for Child Health Research, University of Tampere School of Medicine, Tampere, Finland, and Department of Nutrition, Exercise and Sports, Faculty of Science, University of Copenhagen, Frederiksberg, Denmark. Emergency Nutrition Network, Oxford, UK. Nutrition for Health and Development, World Health Organization, Geneva, Switzerland. The Alliance for International Medical Action, Dakar, Senegal. United Nations Children's Fund, Dakar, Senegal. Action Against Hunger, Dakar, Senegal. Action Against Hunger, New York, NY, USA. The prospect of MUAC-focused management strategies led by caregivers and community members has great potential for enhancing public health impact by facilitating community sensitization and early treatment of affected children, reducing late-stage clinical complications and hospitalizations, and increasing coverage of CMAM programs.8 The primary objectives of this systematic review are therefore to summarize the published and operational evidence describing (1) the use of MUAC by caregivers and CHWs in community settings for the detection and diagnosis of SAM, (2) the treatment of SAM by CHWs in community settings, and (3) health platforms where MUAC use and SAM management have been successfully integrated. Date of publication was 2000 onwards (from the time CMAM programs became operational). Observational studies, experimental studies, intervention studies, and reviews were all eligible for inclusion. Excluded studies included those that were not available in English, those that did not directly address CHW or caregiver use of MUAC, those that occurred within clinic or hospital settings, and studies of infants younger than 6 months as MUAC is not currently a recommended indicator for acute malnutrition screening in that age group. 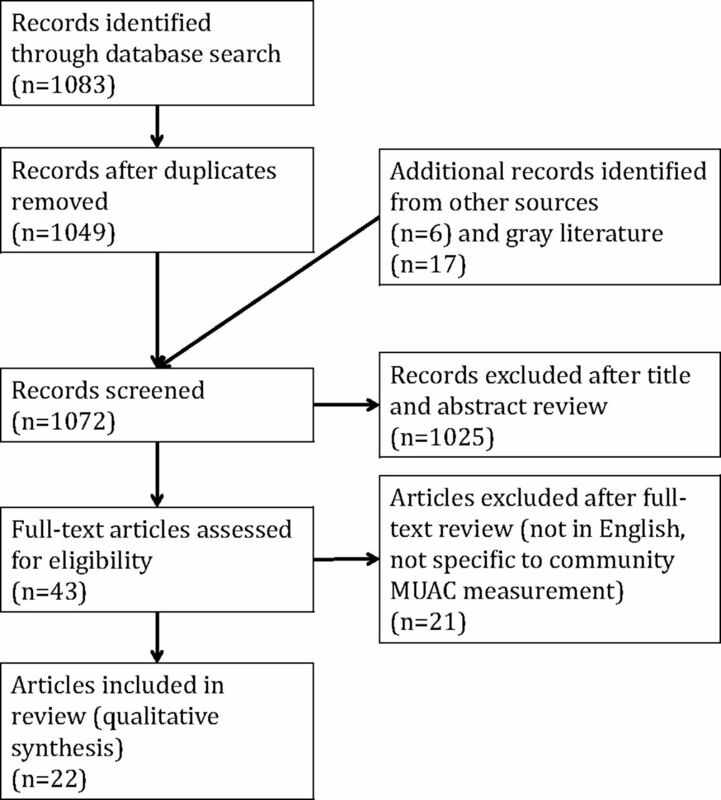 Five information sources were used for this review: A database search of peer-reviewed publications was conducted between September 15 and October 15, 2017, using PubMed and Google Scholar; the gray literature was searched on Emergency Nutrition Network (ENN) and Coverage Monitoring Network (CMN) websites between October 15 and October 30, 2017); records from the bibliographies of studies found in our database searches were retrieved between October 15 and October 31, 2017; and lastly, suggestions of relevant sources from experts in the field, including unpublished or operational materials, were received between September 15, 2017, and March 5, 2018. Our electronic search strategy used the following terms and queries: “community health worker” AND “acute malnutrition” OR “SAM” OR “MUAC”; “reliability” AND “community health worker” AND “anthropometry”; “community screening” AND “malnutrition” AND “child”; “family MUAC”; “MUAC” AND “community diagnosis” OR “community detection”; “acute malnutrition” AND “community detection” OR “community diagnosis”; “MUAC” AND “integration”; “MUAC” AND “health system”; “MUAC” AND “vaccination”; “home-based therapy” AND “SAM”; home-based therapy'” AND “acute malnutrition”. The study selection process included 4 steps. First, a list of potential studies was compiled via our database search and from expert sources. Second, titles and abstracts were screened based on the eligibility criteria, and third, eligible articles were selected for full-text reading and further screening. The bibliographies of full-text articles were also screened for additional articles that were eligible for inclusion. Finally, articles that met the criteria were submitted for data extraction. For published literature, a standardized form was used for simultaneous data retrieval and data entry of the following items: record reference, objective of study, study design, study population, intervention, control (if any), key findings, operational lessons, study strengths and weaknesses, and comments. For gray literature sources, the reference, organizational source and setting, the objective of the document, and key messages were recorded. Data were extracted by one author and reviewed by second authors. We synthesized the findings of the included studies by summarizing key findings, identifying trends across studies, and noting operational challenges faced during implementation. Disagreements were mutually resolved between all authors. Both the published and the operational materials informed our conclusions, with recognition that individual studies may be biased toward publication of positive results. We screened 1,072 records and selected 43 records for full-text screening. We included 22 studies in the review (Figure). A brief summary of each of the 22 studies reviewed is presented in Table 1 (published literature, n=11) and Table 2 (operational materials, n=11). Of the published studies reviewed here, 10 were observational studies describing existing or experimental use of MUAC within communities, and 1 was a randomized control trial evaluating an integrated model for acute malnutrition care. All studies reviewed were conducted in rural settings. Studies included those with paid and volunteer CHWs. The operational materials included 5 reports describing existing community MUAC programs, 3 reports of new tools being developed to facilitate community MUAC use, 1 stakeholder report describing MUAC integration modalities, 1 observational study of community MUAC use, and 1 summary of a randomized control trial to evaluate new acute malnutrition care protocols. Our results and the discussion are organized around these categories. We identified 3 research studies of caregiver detection of SAM using MUAC tapes (Niger10,11) or alternative MUAC devices (Kenya12) that indicate that caregiver-focused approaches are reliable and feasible. Blackwell et al. (2015) found that mothers were capable of using standard MUAC tapes to classify SAM cases with >73% sensitivity and >98% specificity in a pilot study in Niger; this was comparable with CHW performance of 80% and 96%, respectively.10 Mothers responded positively to being engaged in monitoring their child's nutritional status, and their comprehension of how MUAC classification corresponded to admission (or exclusion) from SAM treatment programs improved. The simplified MUAC protocol—measurement of either arm, at a midpoint ascertained visually—performed as well as the standard protocol.10,13 In a follow-up study in Niger, Alé et al. (2016) observed that in areas where caregivers were using MUAC tapes to detect SAM in their own households in Niger, the median MUAC of SAM cases admitted to outpatient therapeutic programs was significantly higher than in areas where CHWs were doing the screening.11 There were also fewer complicated cases and hospital admissions among mother-referred cases. Most recently, Grant et al. (2018) compared the performance of 3 prototype “Click-MUAC” devices with an improved MUAC insertion tape (“UniMUAC” tape) among caregivers in Kenya.12 The 3 prototypes, which resembled plastic cuffs and tapes, had internal circumferences of 115 mm or 115–125 mm and were hoped to improve case-finding sensitivity over the standard MUAC insertion tapes. Each of the prototypes yielded high sensitivity (>93%) and specificity (>98%), but the UniMUAC tape was superior in both sensitivity (100%) and level of agreement between caregiver, health facility staff, and data collection staff measurements (98%) when screening for SAM. We found mixed evidence of CHW MUAC measurement in 2 other studies, one from Niger and one from Pakistan. Alé et al. observed that mothers' MUAC classifications agreed more often with nurses' than those made by CHWs in Niger: mothers' measurements agreed with nurses' 75% of the time, contrasted with only 40% of the time between CHWs and nurses. CHW performance in this case was not described as deficient, despite the discrepancy when compared with caregiver performance.11 Rogers et al. (2017) report that MUAC was correctly measured for just 57% of children in their study from Pakistan.24 While the authors concluded that CHWs are capable of accurate SAM diagnosis, they speculated that the low rate of correct MUAC measurements was due to operational constraints and low CHW motivation. We identified 5 published research studies from Bangladesh, Malawi, and Mali that report consistently successful outcomes of programs or pilot studies of CHW-managed SAM diagnosis and treatment at the household level.19–23 The findings of these studies, which span clinical outcomes of SAM cases, quality of care provided, and cost-effectiveness, indicate that CHWs are capable of providing high-quality, effective care for uncomplicated SAM at a lower cost than inpatient care models, given adequate operational support and supervision. We found evidence of unsatisfactory CHW management of SAM in 2 instances, one in the study by Alvarez-Moran et al. in Mali (2017) and in work done by Grant et al. in Pakistan (2018).19,24 Alvarez-Moran et al. (2017) found in Mali that for some tasks, such as administering antibiotics, CHW performance was deficient.19 Similarly, in the study by Rogers et al. (2018) in Pakistan, quality of CHW care for SAM was not provided at a consistently high level. While 68% of uncomplicated SAM cases received the correct medical and nutritional care (RUTF, antibiotics, and folic acid), only 4% of cases received the full package of medical and nutritional care and nutritional counseling messages. This low compliance was attributed to operational challenges—namely stock outages—and low CHW motivation owing to lack of extra remuneration.13 Nonetheless, and important to note, is the fact that the clinical outcomes of SAM cases in the Pakistan study were noninferior to traditional facility-based models. In other words, failure to deliver the full package of care did not result in low performance or SAM recovery outcomes relative to other care modalities. There are ongoing efforts to create tools that facilitate SAM diagnosis and treatment by low-literacy CHWs in Chad, India, Mali, and South Sudan. These include the use of visual materials for RUTF dosage and icons to enable reliable case documentation and monitoring.14 Simplified dosage protocols that do not depend on measuring child weight, as described in Phase 1 of the Combined Protocol for Acute Malnutrition Study (ComPAS) in Chad, Jordan, Kenya, Pakistan, and Yemen, will also facilitate CHW treatment.26 How to safely combine low-literacy tools with the ability to administer antibiotics, assess for danger signs, and refer appropriately when needed requires further exploration. Nyirandutiye et al. (2011) reported on the use of MUAC during National Nutrition Week activities in Mali; the event typically has 80% to 90% coverage nationwide and is a promising partner platform for SAM screening and referrals. The difference in screening coverage was substantial: 52% of eligible children (those in the 6–59-month age range) were screened during the event, compared with 22% screened at health centers and 5% screened in the community in the months following the event.28 The discrepancies in screening rates suggest that both facility and community-based SAM screening have considerable room for improvement: half of the children with acute malnutrition in their survey had been at a health center within the previous 4 months, but only a quarter of them had been assessed for malnutrition. Caregiver-focused models for detecting and classifying SAM using MUAC have potential for increasing coverage and detecting acute malnutrition earlier than standard MUAC protocols. Given the rapid expansion of simplified protocols for caregiver-led pilots and programs, the evidence base is likely to broaden in the next few years. While it is too early to assess the sustainability of caregiver MUAC programs, there is some evidence of high variation in the level of involvement and activity that mothers invest following training. For example, at ALIMA's initial site in Niger, 60% of mothers in the project area have been trained and >70% of CMAM admissions are now referred by mothers.15 In contrast, 7 months after an MUAC Mothers training in India, only 30% of mothers reported having ever measured their children.16 Understanding how to best motivate and engage caregivers to participate in MUAC measurements and addressing any barriers or stresses created by this responsibility are important questions going forward. Most of the available evidence supports the ability of CHWs to reliably measure MUAC to the standard necessary for SAM screening. It is worth noting that although MUAC is widely considered a simple indicator for measurement and interpretation, there are examples where the metric was not accepted by CHWs and/or not accurately measured by community workers in the context of growth monitoring and basic anthropometric training30–32 (not included in this review as they did not meet inclusion criteria). Several studies indicate that the use of MUAC by caregivers and CHWs is a missing link in the integration of SAM care into other platforms, be it integration with MAM programming;27,33 integration into nutrition or health-focused events such as nutrition weeks, vaccination campaigns, nutrition events, water, sanitation, and hygiene (WASH) programming, or well-baby clinics;28,34 or incorporating MUAC assessment and treatment into existing iCCM programs.35 As many of the studies reviewed in this article suggest, and as reported by a study of the integration of SAM care into Niger's national health system, the complexity of acute malnutrition intervention protocols (multiple indicators, treatment types, locations, and steps in care) hinders integration.36 Integrating SAM care successfully does not necessarily require integrating every aspect of its treatment, nor is integration a solve-all for inadequate resources or staff.37 The optimal mix, or level of mixing, between MUAC use, SAM care, and other activities will likely vary widely depending on context, content, and complementarity of joint activities, among other factors. As with most systematic reviews, this review is subject to publication bias. Published research on MUAC use is likely biased in favor of successful programs; as a result this review may be missing important lessons learned from pilot programs and trials that did not show an apparent positive impact of caregiver or CHW use of MUAC for SAM detection, diagnosis, and/or treatment. Nonetheless, our review did yield work reporting negative outcomes (see Rogers et al. 201713). Most of the studies reviewed here are observational rather than interventional, so inference is limited. Furthermore, most of the published evidence describes intensively delivered, small-scale interventions, and is not readily generalizable to larger scale, public-sector health care systems. With few exceptions, the studies reviewed here contain little information about the demographic and socioeconomic characteristics of study participants. The absence of this contextual information, the narrow geographic scope of the available studies, and variation in how/whether training and remuneration were delivered limits our ability to generalize findings. Differences in settings, cultures, training protocols, and populations will have implications for the usefulness and acceptability of MUAC. Caregivers are able to use MUAC to detect SAM in their children with little apparent risk and many potential benefits to early case detection and coverage. CHWs are able to diagnose SAM and provide high-quality treatment with increased coverage, particularly when using simplified protocols and when supported by strong supervision. Without adequate supervision, training, and/or remuneration, the quality of care is likely to suffer. The correct administration of antibiotics by CHWs as well as the ability to detect and refer for danger signs requires further consideration. There is currently only limited evidence on SAM treatment outcomes using this approach, and little consideration of the impact on other child health outcomes under the remit of CHWs. While most practitioners consider MUAC relatively simple, it still requires good training and community advocacy in settings where it is unfamiliar. Ongoing research into simplified protocols, modified MUAC tapes, MUAC-based RUTF dosages, and low-literacy treatment tools will all support diagnosis and treatment of SAM by CHWs at household level. The available literature indicates that improvements in coverage are likely when SAM management protocols are simple and the proposed platform for integration is composed of complementary nutrition-related activities. In recognizing the benefit of MUAC as a community tool, it is important to recognize that current MUAC criteria do not select for all high-risk children, including low weight-for-height children, and the optimal approach will vary across different contexts. More research is needed to identify different options to identify these high-risk children in the community and ensure successful diagnosis and treatment. In conclusion, scaling up the use of MUAC to detect SAM in communities is a promising step toward greater coverage and use of existing CMAM services. Given adequate operational support, training, and supervision, the quality of care for self-referred and/or CHW-treated cases is likely to be comparable with current health worker and CMAM models. Further research regarding scalability and applicability of community MUAC use across a wide range of contexts is needed and warranted. In some contexts, the use of MUAC as the primary criterion for detection, diagnosis, and discharge may be appropriate and should be explored further. Funding: This study was funded by ECHO, grant number ECHO/-WF/BUD/2017/91048. Disclaimer: The authors alone are responsible for the views expressed in this article and they do not necessarily represent the decisions, policy or views of the World Health Organization.
. The State of Global SAM Management Coverage. London: United Nations Children's Fund (UNICEF)/Coverage Monitoring Network/Action Against Hunger International; 2012. https://www.actionagainsthunger.org/publication/2013/10/state-global-sam-management-coverage-2012. Accessed July 27, 2018. Joint child malnutrition estimates 2018 (UNICEF-WHO-WB). The World Bank website. http://datatopics.worldbank.org/child-malnutrition/. Accessed January 24, 2018.
. Mid Upper Arm Circumference and Weight-for-Height Z-Score as Indicators of Severe Acute Malnutrition. London: Oxford: Emergency Nutrition Network; 2012. https://www.ennonline.net/muacandweightforheightindicators. Accessed July 27, 2018. Preferred Reporting Items for Systematic Reviews and Meta-Analyses: The PRISMA Statement. Equator Network website. http://www.equator-network.org/reporting-guidelines/prisma/. Accessed March 8, 2018.
. Enabling low-literacy community health workers to treat uncomplicated SAM as part of community case management: innovation and field tests. Field Exchange. 2016;(52):3. https://www.ennonline.net/fex/52/communityhealthworkerssam. Accessed July 27, 2018.
. Families screening for malnutrition by MUAC and edema [PowerPoint Slides]. Alliance for International Medical Action; 2017.
. Family MUAC Approach [internal report]. Action Against Hunger; 2017.
. CMAM Forum FAQ: Training Mothers to Screen for Malnutrition by MUAC and Checking for Edema [internal report]. CMAM Forum; 2016:1–3.
. Mother-Led MUAC Toolbox for Implementation [PowerPoint slides]. World Vision; 2017.
. Community Case Management of Severe Acute Malnutrition in Southern Bangladesh. Feinstein International Center; 2011. http://fic.tufts.edu/publication-item/community-case-management-of-severe-acute-malnutrition-in-southern-bangladesh/. Accessed July 27, 2018.
. Linking Integrated Community Case Management & Nutrition: New York, NY Meeting Report: 11–12 December 2014. https://coregroup.secure.nonprofitsoapbox.com/storage/documents/Linking_Integrated_Community_Case_Management__Nutrition_NYC_Meeting_Report.pdf. Accessed August 11, 2018.
. Combined protocol for SAM/MAM treatment: the ComPAS study. Field Exchange. 2017;(53):44. https://www.ennonline.net/fex/53/thecompasstudy. Accessed July 27, 2018.
. Community Engagement for CMAM. Coverage Monitoring Network; 2015. http://www.coverage-monitoring.org/wp-content/uploads/2015/07/Technical-brief-Community-Engagement-for-CMAM-20151.pdf. Accessed July 27, 2018.
. Linking Nutrition & (Integrated) Community Case Management: A Review of Operational Experiences. London: Save the Children, Action Against Hunger, Children's Investment Fund Foundation; 2014. https://www.ennonline.net/linkingnutritionintegratedcommunitycasemanagementareviewofoperationalexperiences. Accessed July 27, 2018. Action Against Hunger. ACF-USA-Click-MUAC-Project [PowerPoint slides]. Action Against Hunger and the Humanitarian Innovation Fund; 2017.